For Johann Sebastian there was always music. His family had been musicians, or bachs as they were called in Germany, for 200 years. He always wanted to be a bach. As he grew, he saw patterns in everything. Patterns he would turn into melodies and song, eventually growing into one of the most important and celebrated musical composers of all time. This is the story of Johann Sebastian Bach. 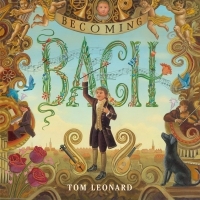 A well-researched, engaging look at the life of Johann Sebastian Bach, told from his perspective complete with gorgeous, often magical illustrations.